Dave is fourteen years old, eager and headlong. He is about to start high school, which is scary and alluring. 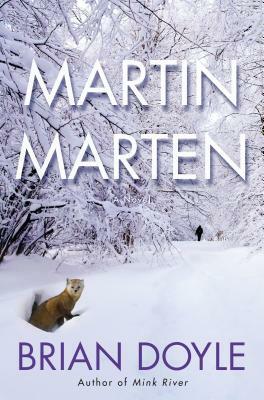 Martin is a pine marten, a small, muscled hunter of the deep woods. He is about to leave home for the first time, which is scary and thrilling. Both of these wild animals are setting off on adventures on their native Mount Hood in Oregon, and their lives, paths, and trails will cross, weave, and blend. Why not come with them as they set forth into the forest and crags of the mountain and into the bruising wilderness of love, life, family, friends, enemies, wonder, mystery, and good things to eat? Martin Marten is a braided coming-of-age tale like no other, told in Brian Doyle's joyous, rollicking style. Two energetic, sinewy, muddled, brilliant, creative animals, one human and one mustelid...come sprint with them through the deep, wet, green glory of Oregon's soaring mountain wilderness. BRIAN DOYLE (1956-2017) was the longtime editor of Portland Magazine at the University of Portland, in Oregon. He is the author of six collections of essays, two nonfiction books, two collections of "proems," the short story collection Bin Laden's Bald Spot, the novella Cat's Foot, and the novels Mink River, The Plover, and Martin Marten. He is also the editor of several anthologies, including Hoolaulea, a collection of writing about the Pacific islands. Doyle's books have seven times been finalists for the Oregon Book Award, and his essays have appeared in The Atlantic Monthly, Harper's, Orion, The American Scholar, The Sun, The Georgia Review, and in newspapers and magazines around the world, including The New York Times, The Times of London, and The Age (in Australia). His essays have also been reprinted in the annual Best American Essays, Best American Science & Nature Writing, and Best American Spiritual Writing anthologies. Among various honors for his work is a Catholic Book Award, three Pushcart Prizes, the John Burroughs Award for Nature Essays, Foreword Reviews' Novel of the Year award in 2011, and the Award in Literature from the American Academy of Arts and Letters in 2008 (previous recipients include Saul Bellow, Kurt Vonnegut, Flannery O'Connor, and Mary Oliver).